Winter has begun, and with it, the cold and flu season has arrived! Flu is already running rampant in the Southeast. So how can you keep your smallest family member healthy? With germs all around, protecting your family from the cold and flu can seem like an impossible task. That’s especially true when you have a baby, since the immune system isn’t fully developed for months after birth and your little one can’t be vaccinated against the flu until age 6 months. That may seem sobering, but know that it is possible to reduce your little one’s risk of developing an illness during cold and flu season. Read on as we offer a few tips. Vaccinate everyone else in the household. If your little one is younger than age 6 months, he or she can’t be vaccinated against the flu. But nearly everyone else can! 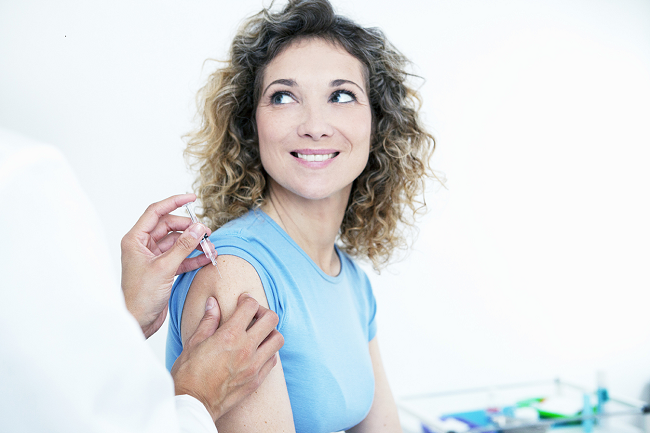 If you’re pregnant between September and March, you should be vaccinated against the flu — and your antibodies will pass along to your baby through the placenta. Otherwise, everyone around the baby should be vaccinated, unless a doctor advises against it. This provides a “cocooning” effect that can help protect the little one who can’t be vaccinated. Keep your baby covered in public. Whether you’re strolling through the mall or making a trip to the grocery store, keep a cover or thin blanket draped over the car seat or stroller. This has a dual purpose: it will keep people from touching or coming in contact with your baby and it will provide another layer of warmth. It’s also a little extra protection from all the germs that are flying around! Disinfect! Speaking of germs out in public, it’s important to wipe them off any surface you contact. Did you know that germs can live on a shopping cart handle for up to five hours? Gross! Carry disinfecting wipes and wipe down commonly touched surfaces, and use hand sanitizer on your hands if you’re touching things in public. This will help lower the risk of you passing those germs along to your little one. Keep your baby away from those who are sick. This includes both members of your own household and guests. If someone you know or regularly encounter has a fever or other symptoms of illness, don’t allow the person to touch or come near your baby until at least 24 hours after symptoms disappear. This may be hard if a family member is the sick one, but try to keep the baby in a different room from the sick person whenever possible. And disinfect the house regularly when illness is present. If you can, breastfeed. Babies who are exclusively breastfed for six months are less likely than those who are formula-fed to develop colds and ear and throat infections. That’s because the mom’s antibodies against these illnesses are passed along through breast milk, giving babies an added defense. But if you’re unable or don’t wish to breastfeed, there are other steps you can take to protect your babe! See above. If, despite your best precautions, your little one develops an illness, see your pediatrician. Because babies are so small and haven’t fully developed an immune system, any illness can develop into a serious issue. Most at-home remedies, particularly those involving medications, are not approved for use in small children. Talk with a doctor about how to best alleviate your little one’s symptoms. Knoxville native Yuri Sawa, MD, is dedicated to providing compassionate, quality medical care for all ages in the Soddy-Daisy community. Her family practice includes treating acute illness and chronic disease, performing minor procedures, and helping patients with women’s health and behavioral health needs. Learn more at erlanger.org/soddydaisy.